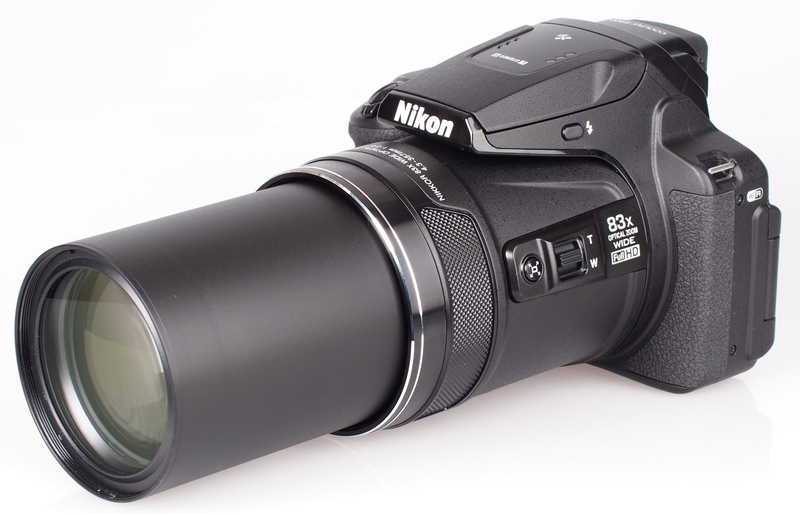 We review the new Nikon Coolpix P900, an ultra zoom bridge camera with a massive 83x optical zoom lens. 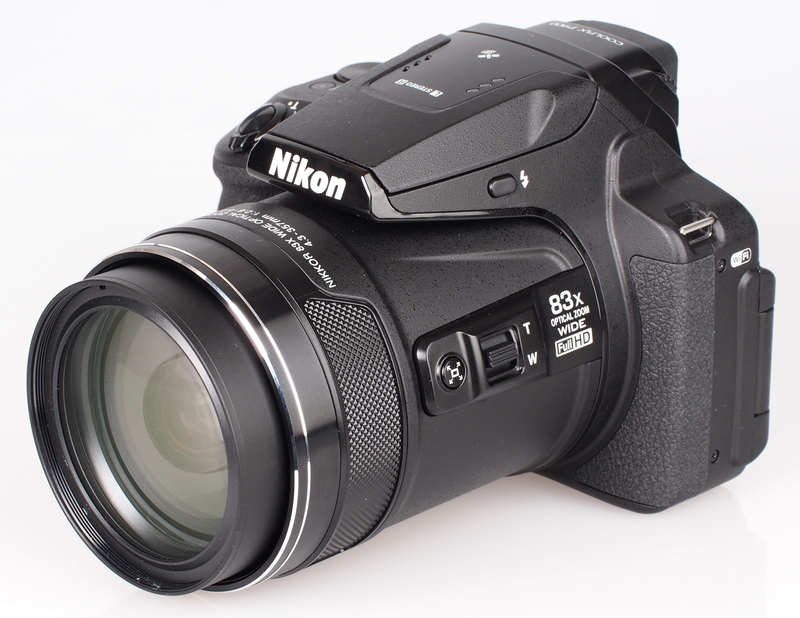 The Nikon Coolpix P900 is Nikon's latest ultra-zoom camera, and features the World's longest optical zoom lens, with an 83x optical zoom lens, equivalent to 24mm wide-angle zooming to 2000mm at the telelphoto end. 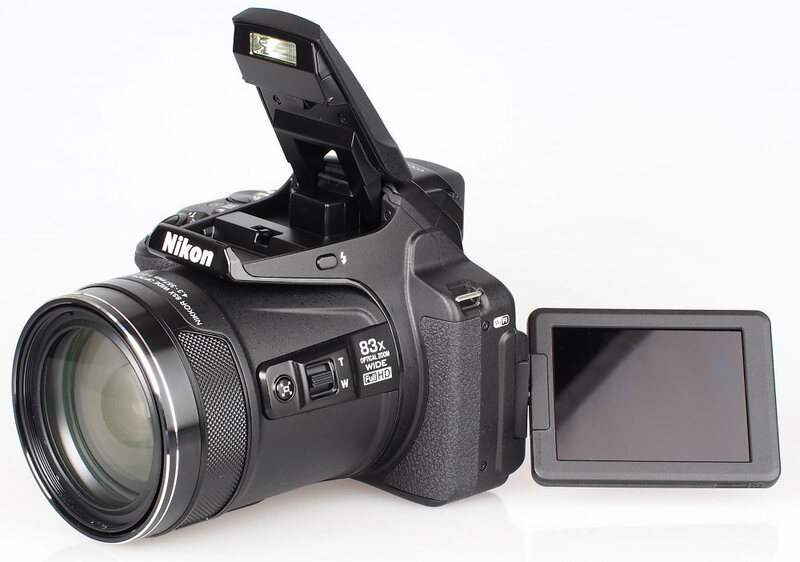 The camera features a built-in EVF with eye-sensor, a vari-angle tilting screen, as well as built-in Wi-Fi, GPS and NFC. 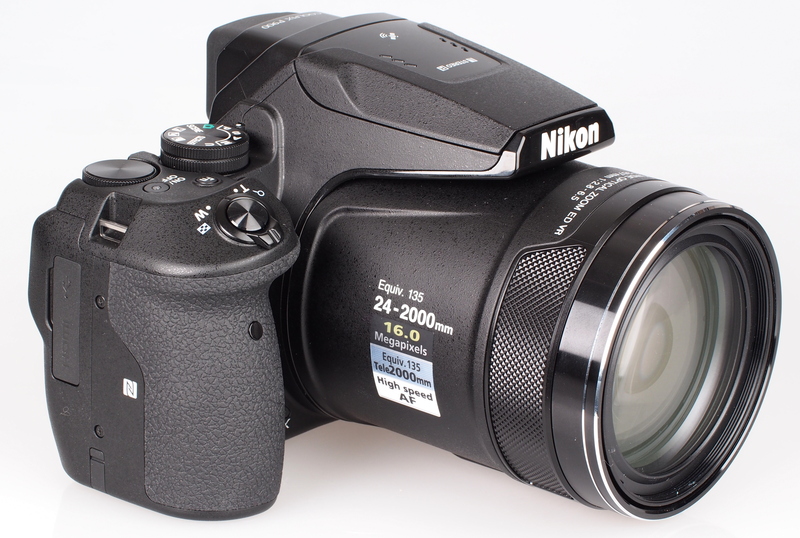 The headline feature of the Nikon Coolpix P900 is the whopping 83x optical zoom lens, equivalent to 24-2000mm in 35mm terms, it features an f/2.8 aperture at 24mm, and f/6.5 aperture at 2000mm. Optical Vibration Reduction (VR) is built in which is said to give 5-stops of image stabilisation, which will be essential if you want to get sharp shots when using the full 83x optical zoom. 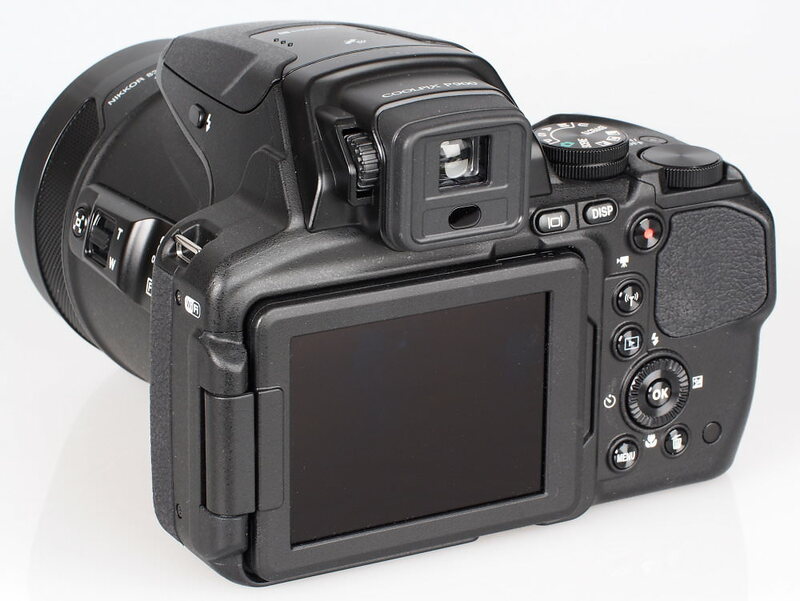 The sensor is a 16 megapixel backlit CMOS sensor, and the camera features both a 3inch vari-angle screen, as well as an electronic viewfinder (EVF) with eye-detection sensor, so that it will automatically switch on when the camera is held up to your eye. Rapid AF is designed to give quick shooting speeds, and the camera records fullHD video. Built-in Wi-Fi and NFC makes transferring photos to a smartphone or tablet easy and straightforward, and built-in GPS/GLONASS/QZSS means you can automatically add geotag location information to your photos. There are numerous scene modes to help you get the best from the 83x optical zoom lens, including a dedicated moon scene mode, as well as a bird watching scene mode. Including numerous scene modes, there is built in HDR shooting, as well as a built-in time-lapse movie creation feature, that will take a number of shots over a period of time, and automatically create a video from the images. The Nikon Coolpix P900 feels well built with a solid plastic body. The camera has a large rubberised hand grip, with a large thumb grip on the rear of the camera as well. The left-hand side also features a rubber grip, and the lens has a textured plastic area to aid grip. Whilst you can hold the camera with one hand, it is recommended that you use two hands to hold the camera securely due to the size and weight of the camera. 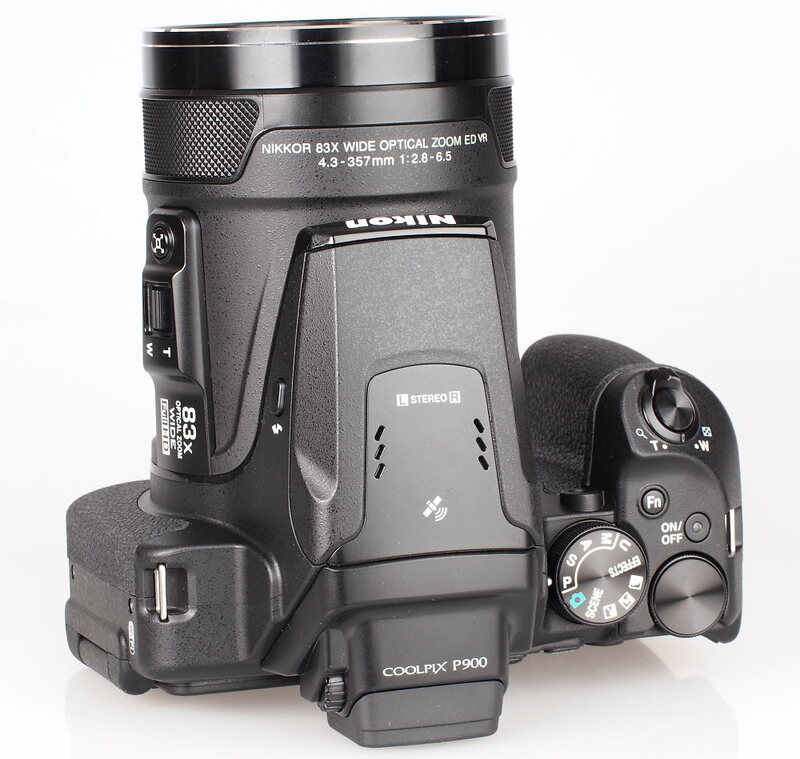 The P900 weighs 899g with the battery and memory card, and measures 139.5mm x 103.2mm x 137.4mm making it larger and heavier than many Digital SLRs. The majority of options are set in the menu system, with the camera having only a few external buttons and controls to change camera settings. You can set the exposure compensation, focus mode, self-timer and flash options with the scroll wheel on the back, or customise the Function (fn) button to give access to another options such as the ISO setting, or drive move. There is a snap-back zoom button on the left of the lens barrel, and the Side zoom control can be used to change the zoom, or can be set to manual focus. The front of the lens has a 67mm filter thread, which makes it possible to attach filters, although unfortunately the camera doesn't come with a lens hood, or shade, and there isn't currently an optional hood available on the Nikon website. The Nikon menus are clearly laid out, with options spread over five main screens, including a shooting menu, movie options, Wi-Fi options, Location data options, and Setup options. The screen is not a touch-screen, however it does have good viewing angles, and shows a good resolution with clear results. The electronic viewfinder (EVF) is a decent size, bigger than some other compact cameras, but not as large as those found on mirrorless cameras. The resolution is good and there is a diopter adjustment dial on the side. 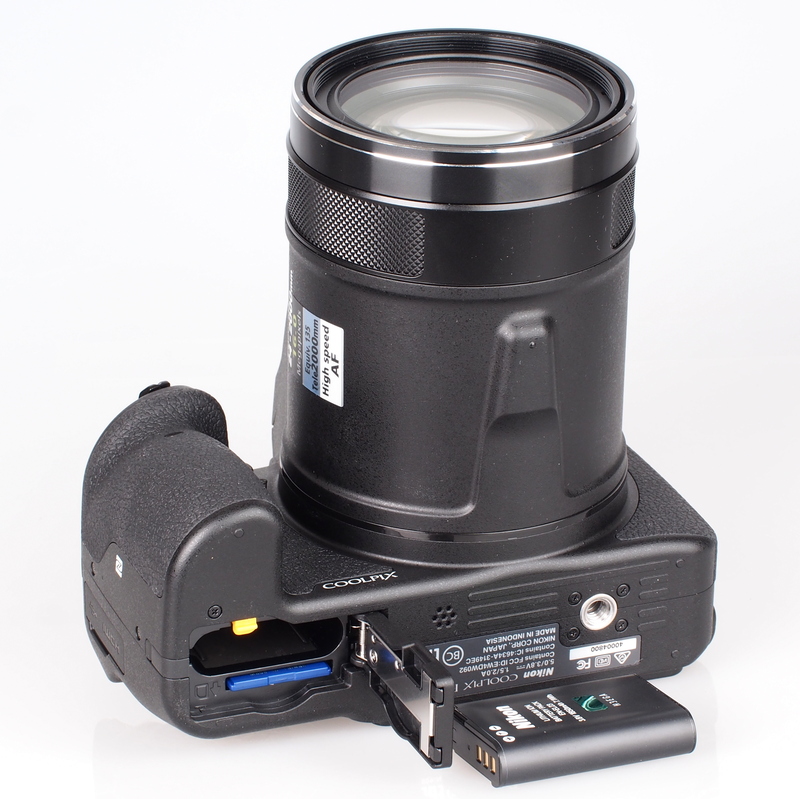 The eye-detection sensor means the camera will automatically switch to the EVF when held up to your eye. Wi-Fi features - Built-in Wi-Fi lets you connect the camera to your smartphone using the Nikon Wireless Mobile Utility available for iOS and Android devices. The app is quite basic, letting you remotely take photos, or view and transfer photos from the smartphone. Battery life - Battery life is rated at 360 shots according to Nikon / CIPA test results, which is quite good although extended use of the built-in GPS and Wi-Fi is likely to reduce the number of shots possible. Shutter response is very quick, and focus is also very quick, as long as the camera correctly focuses. It's also possible to shoot at 120fps with a reduced VGA resolution, and 60fps with a resolution of 1megapixel. *Tested at 285mm / 66x optical zoom / 1596mm equivalent. 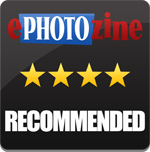 Sample Photos - Photos show good colour and saturation, with reliable exposure. Skin tones are good and portraits taken with flash show very little to no red-eye, although better results may be achieved by using flash compensation to turn it down slightly. The 83x optical zoom lens lets you zoom into distant subjects, and assuming there are no atmospheric or weather issues, then detail is good, and it's even possible to shoot handheld at full zoom and get sharp shots. Lens Performance - Images have reasonably good dynamic range, and images are good into the corners whether shooting at the wide end of the lens, or the telephoto end of the lens. Images are a little soft, and occasionally flare is visible when the sun or another bright source is in the frame, however overall the results are very good considering the impressive zoom range available. Barrel distortion is well controlled at the wide-angle end of the lens with the camera automatically correcting this in camera, although this is visible at times when using the zoom. Very slight vignetting is visible at the wide-angle end of the lens, although this isn't noticeable in outdoor shots. Purple fringing is very well controlled, with some becoming visible at the telephoto end of the lens. When shooting at the telephoto end of the lens, it's possible to take sharp handheld shots thanks to the built-in optical Vibration Reduction doing an excellent job. We were able to take sharp shots of the moon at 2000mm, with a shutter speed of 1/500th of a second. Macro focus is from the front of the lens (0cm), letting you focus on any dust on the lens, and in manual focus you can actually focus closer than the front element of the lens, although I'm not sure there is any benefit to this. When using manual focus, the camera has focus peaking built in and it's possible to adjust the thickness of the focus peaking highlights. Using the Nikon Coolpix P900, we were able to take this series of photos of the Solar Eclipse, with the use of ND filters on the front of the camera. ISO Noise Performance - For the lowest noise and best detail possible we would recommend using ISO100 to ISO200, as images have low levels of noise and good levels of detail. At ISO400 noise is still quite low, however detail starts to drop off. For lower light situations ISO400 to ISO800 still provides good results, although noise increases and detail is reduced. At ISO1600 and ISO3200 noise levels become strong and we would recommend avoiding this setting if possible, although results may still be useful if resized and used on the web. ISO6400 is best avoided as noise is high, and detail is very low. White Balance Performance - Auto White Balance (AWB) performs well under tungsten lighting, with the tungsten preset giving a good result. There is also a "Warm" Auto White Balance setting to keep the image warm to capture the atmosphere more accurately. AWB performs well under fluorescent lights, with the fluorescent preset giving a magenta colour cast. Panorama mode - The camera features an automatic panoramic mode, where you simply press the shutter release button and pan the camera from one side to the other. Results are good, and well stitched together, although with a low resolution image produced. Digital Filters - There are number of effects available, plus Backlight / HDR modes for expanded dynamic range. Examples can be seen above. Video - Video options and settings include options to record high speed video at 120fps (640x480), and 60fps (1280x720), as well as FullHD at 60/30/50/25p. Audio options include wind filter (on/off) and zoom microphone (on/off). There is an option for electronic Vibration Reduction (VR), as well as Normal and Active VR options in the setup menu. Whilst it is possible to record video handheld and using the full optical zoom, it requires a very steady hand, and for best results a tripod is recommended. Additional videos can be found on the ePHOTOzine YouTube channel. 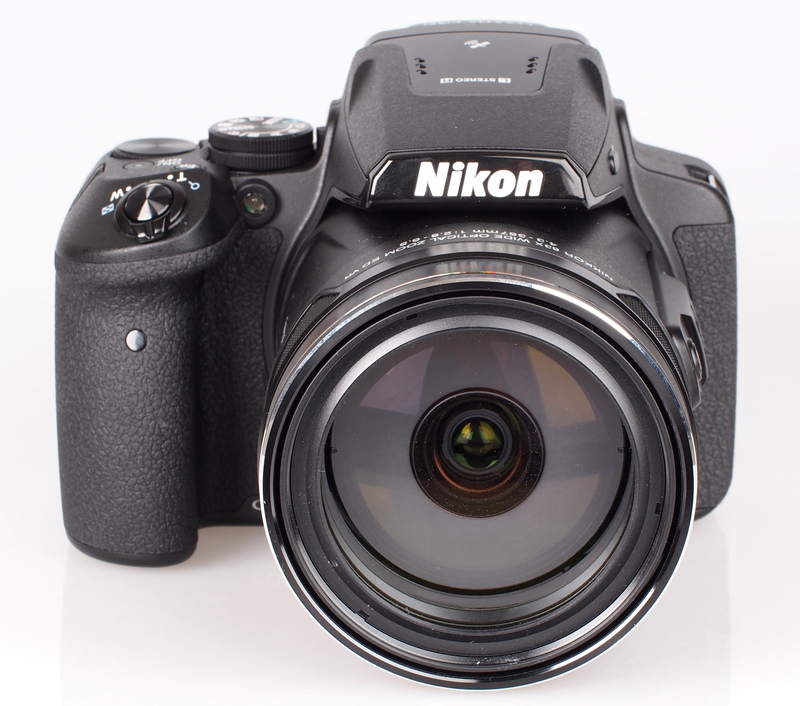 The Nikon Coolpix P900 offers the largest optical zoom lens available in any camera, with a whopping 83x optical zoom lens, zooming from 24mm (equivalent) wide-angle to an impressive 2000mm telephoto! Along with this, the camera is noticeable in its size and weight, large than a number of Digital SLRs, although they're unlikely to offer anywhere near as much zoom. As a camera that offers so much optical zoom, it would be of little use, if you weren't able to take sharp shots, or if you needed to take a tripod with you everywhere you went - thankfully the optical image stabilisation system is extremely impressive, making it possible to shoot handheld, even when using the full 83x optical zoom lens. Admittedly you will get the best results when using a tripod, and with good weather however, it's nice to know that it is possible. Video quality is good and it's here that the massive 83x optical zoom lens can become an issue, as any slight camera or hand movement will cause the image to wobble, and a tripod is definitely recommended for optimum quality. There is very little that comes close to offering so much optical zoom in a bridge camera, and with Wi-Fi / NFC and GPS built in, along with a high resolution screen and electronic viewfinder, the £499 price point is justified, although is likely to be a little too expensive for some. For those that want the most optical zoom available, and a camera that can capture everything from 24mm wide-angle all the way to 2000mm at the telephoto end, the Nikon Coolpix P900 is recommended. The Nikon Coolpix P900 offers an impressive 83x optical zoom lens, along with effective image stabilisation to help get the most out of the lens. 900gms ???? ?......that's a meaty piece of kit ! !......lotsa glass in that amazing lens ??????. The fixed lens advocates say you can zoom with your legs - you'd need to catch a bus to compete with this. Just what I want, but where can I find it in stock? Nikon P 900 is a wonderful camera compared to Lumix Fz70. [youtube]https://youtu.be/E-pKztVME7s[/youtube] The autofocus is faster even in low lights. Nikon P 900 is a wonderful camera compared to Lumix Fz70. The autofocus is faster even in low lights. How is the P900 rated for action shots such as sports ?